Last week our Urban Sketchers Montreal group met at the Redpath Museum, and I thought I’d try out my people sketching technique (Payne’s Grey watercolour and brush in a small sketchbook) on some taxidermy animals. This was a lot harder than I thought it would be even though these guys move a LOT less than the people in Tim Hortons. There are some parts of these creature that you just have to get right, otherwise it can look really wrong. Like where the eyes are on the wolf, or the shape of the head on the polar bear. It left me thinking that drawing people was actually easier than I thought. Or else that maybe I needed to sketch 100 stuffed animals some time. Anyway, this week I went back to sketching people again, at school and in cafés. It was kind of a relief to get back to noses and skin instead of snouts and fur. I had a bit of time today so thought I’d do a step-by-step post of a bouquet of flowers I had on my counter. There are no pencil lines in this, just brush shapes and colour on a pad of Fluid watercolour paper — a quick flower sketch for a grey day in Montreal. The first washes you make on the white paper are the most satisfying, aren’t they? You haven’t overworked anything, or messed up any washes yet! 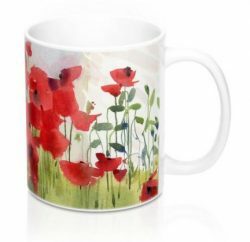 With flowers I try to group the blooms into big masses of colour, and add variety in the washes. 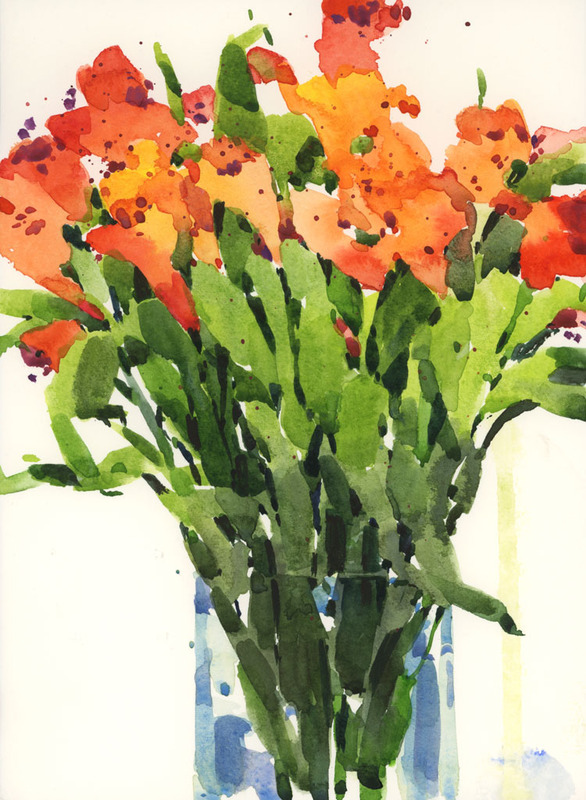 For these Alstroemeria flowers I used yellow, orange and red pigment, and let the washes flow together. The next step is to add the green, again in one big shape. Since the foliage is lightest at the top of the bouquet, under my counter lights, I used more yellow and as I moved down to the foliage in the vase, I allowed the green to darken. When those two washes are dry, the fun part starts. I go back into the flowers to define them a bit. At this stage I think about edges of petals, centres of blooms, etc. This is still fairly loose. The next step is to pick out some of the leaves, figure out what is in front and what is behind, and also where the vase starts. That’s where the sharper darks come in too. The last steps are the final details: a bit of spattering for the flowers, some tiny shapes of stems and the darkest darks. And even though you see 2 brushes in the photo, this was all done with a Winsor Newton #8 brush. Here’s the final sketch, fully dry and scanned. If you are interested in these types of exercises, the paper in these Fluid Field Watercolor Journals is perfect. Colours retain their brightness, the paper is not too textured so you can use an ink line if you wish, and they are reasonably priced too. This was sketched on the 7″ x 10″. 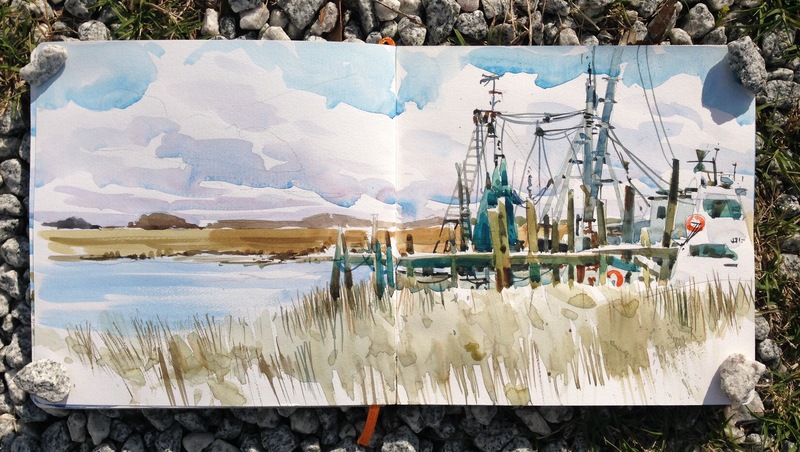 I painted twice at Crosby Seafood in South Carolina. The first sketch was in my sketchbook but I went back a second time because I loved all the complexity and calligraphic marks I would have the opportunity to make because of the rigging and nets. That stuff is so much fun to paint. 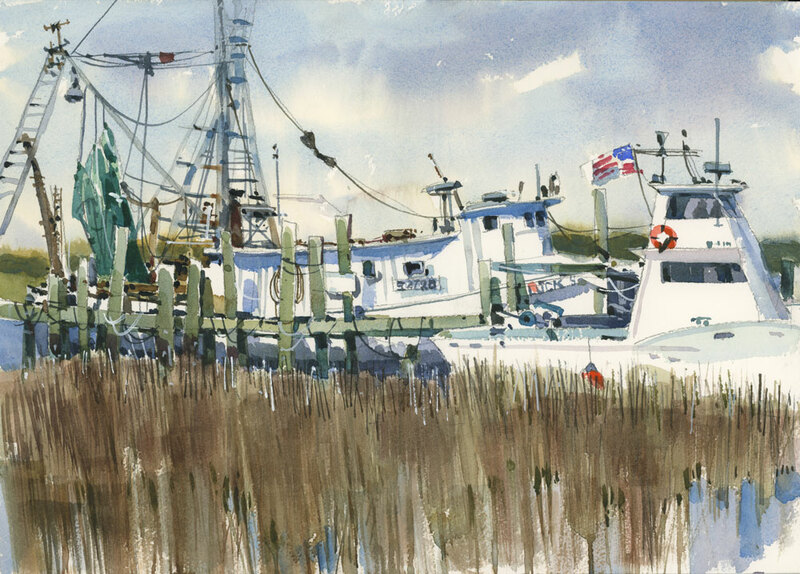 Luckily the second time I painted was during high tide and the boats were higher up in the water. The marsh grasses in the foreground were a challenge. I wasn’t really sure how to deal with them so I painted a series of washes using lots of lines and texture, and tried to keep it quite simple. It’s a difficult shape to deal with — a big rectangle with not much going on — but I tried to suggest the marsh grass and leave it be. Painted on Arches paper, 14″ x 10″. What can I say? 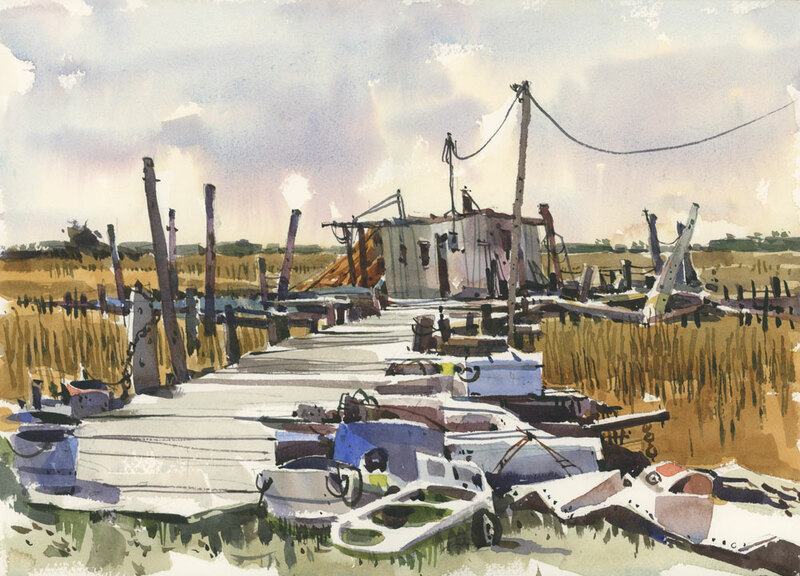 It was a joy to see the rain move out, to paint in colour after over 100 sketches using grey paint, to draw the shapes of boats, to gaze across a wide open sky, to see the flicker of light and shadow, and to be blinded by the glint of sun on water. A real spring delight. I’m curious about something. If you participated in the OneWeek100People challenge, how has it affected your sketching? Are you fed up of sketching people or do you find you want to keep at it? Has the practice changed the way you choose scenes to sketch? I guess because I’m on spring break I have a lot of time to think about this. 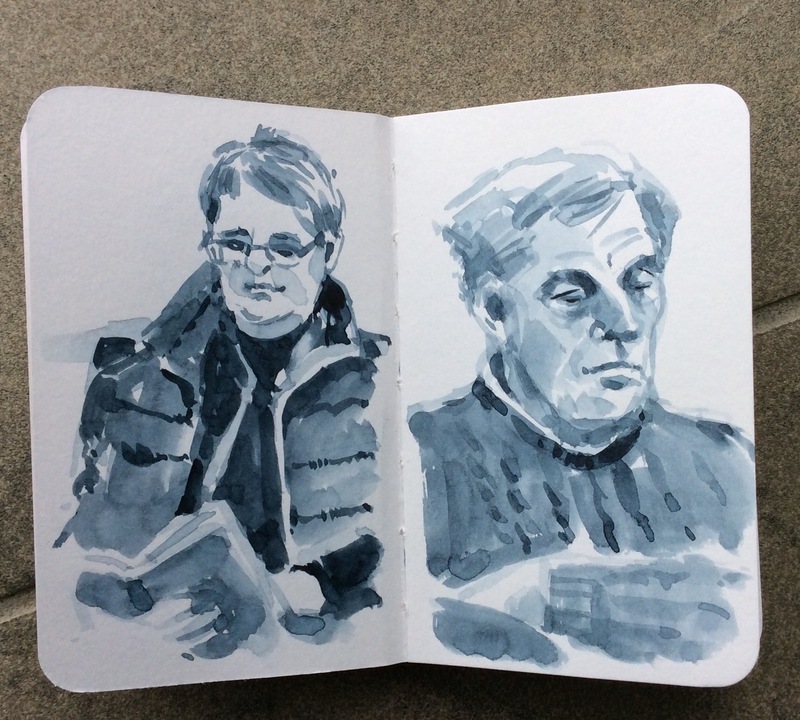 I know that first thing I did in the airport was to sketch the people sitting across from me. 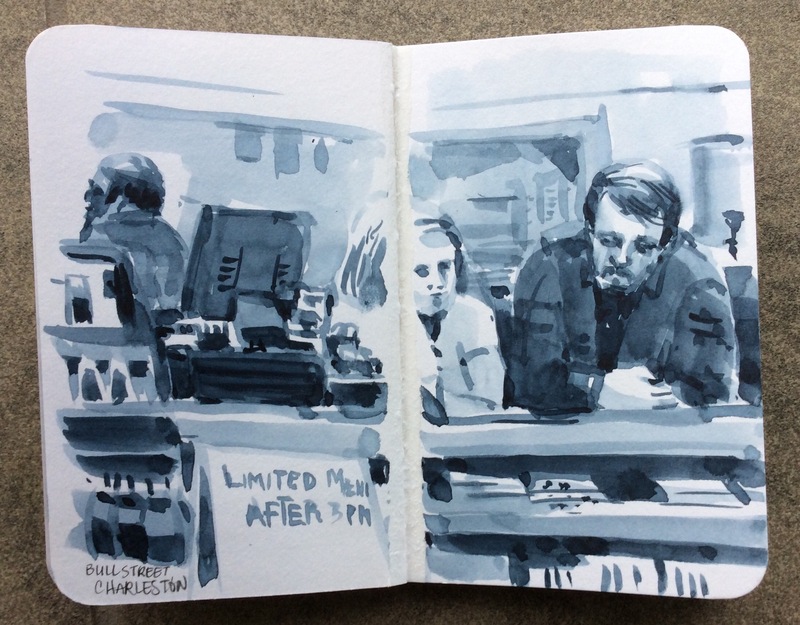 And then because it’s too cold to sketch outside in Charleston, I’ve been sketching in cafes. 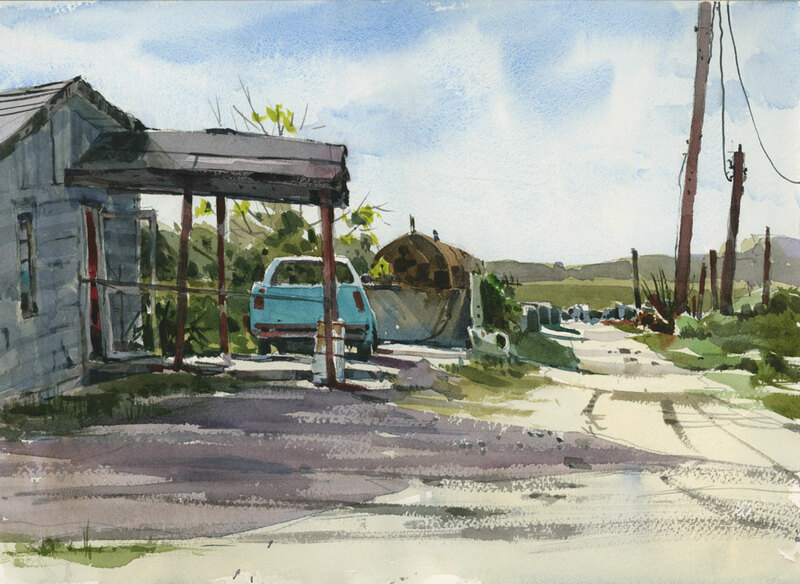 Still with a brush and Payne’s Grey watercolour, still in a tiny sketchbook. But the difference is that now, instead of waiting for people to move out of the scene so I can sketch the objects, I sketch the people too. I don’t think too much about it either. Just draw them with the brush and try to make them fit, like the barista at Tricera Cafe. Or in this scene at the Deli where the two cashiers were doing the Monday crossword at the counter during a slow period after the lunchtime rush. I drew them in but as soon as I brushed in their silhouettes they moved away. Previously I would have turned the page and started again, but that didn’t deter me. I kept at it. I’m sure the figures would have been better if I had been able to look at them longer but I’m still glad I finished it. 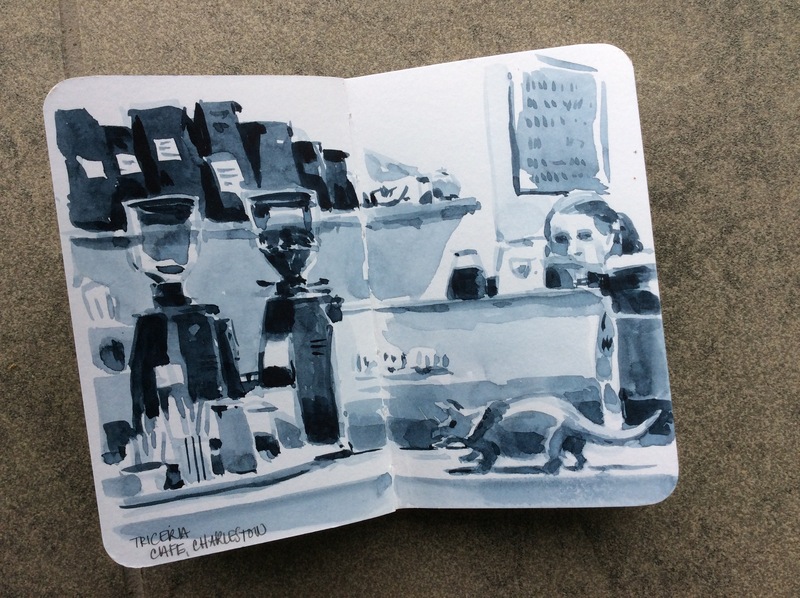 So what was the takeaway from that week of people sketching? A little more confidence, perhaps persistence too, and most importantly, enjoyment and pleasure where there used to be dread.